Some scoff at the idea that face-covering Islamic veils endanger public safety in any Western nation, let alone the United States, but Philadelphians do not have the luxury of blissful ignorance. As recent events highlight, their city has become the American epicenter of robberies and murders carried out by criminals disguised as fundamentalist Muslim women. Several factors help explain Philadelphia’s place at the forefront of this trend. Will other U.S. cities be next? The latest wave of burqa banditry to target Philadelphia began at a branch of More Bank in the East Oak Lane neighborhood two days before Christmas. 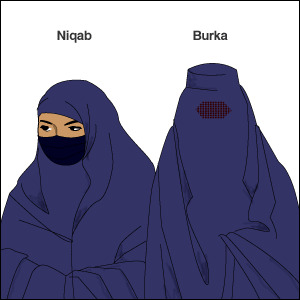 Following similar heists on January 6, March 14, March 20, and April 4, the Philadelphia Police Department and FBI issued a wanted flier for a pair of black males in “Muslim-like clothing covering their heads and bodies.” Surveillance images indicate that the outfits include face veils (niqabs) and “burqa-like robes,” to quote one news item, leaving just the eyes visible. The same Wells Fargo branch struck on April 4 was then hit again on April 13, after which Muslim groups offered $20,000 for information leading to the perpetrators. No arrests or further bank robberies have been reported. The criminal applications of this attire also were on display during an April 18 homicide at a barbershop in Upper Darby, a township bordering West Philadelphia. Police believe that a love triangle inspired Sharif Wynn to enter with a gun and demand money from the barber, Michael Turner. Wynn insists that he merely meant to scare the man, but officers say that he shot Turner intentionally at point-blank range. The police superintendent has revealed that the attacker was “dressed in Muslim female garb, was covered from head to toe. The only thing that was showing was his eyes.” Authorities identified Wynn through interviews and his electronic trail. The worst episode occurred on May 3, 2008, when three Muslim men — two dressed in female Islamic apparel and face veils — held up a Bank of America branch inside a supermarket in the Port Richmond section of Philadelphia. Police Sergeant Stephen Liczbinski gave chase, only to be shot to death by robber Howard Cain, whom officers killed shortly thereafter. Cain’s accomplices were caught, convicted of murder, and sentenced to life. The Philadelphia area endured many additional cases between then and now. On November 16, 2009, a man in a face veil attempted to rob a Bank of America location in the suburb of Drexel Hill, but he left empty-handed after an employee played dumb; DNA from a niqab discarded near the scene later led to an arrest. 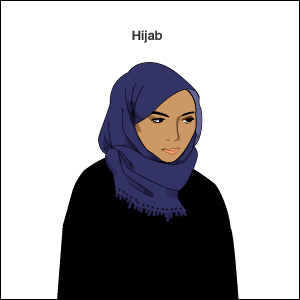 Other unsuccessful perpetrators have included an armed man in a “long black dress … and a hijab covering his head and face” at a Sovereign Bank branch in the city’s Mount Airy neighborhood on February 1, 2011, and a niqab-wearing man at a branch of the same bank in Woodlynne, New Jersey, just across the river from Philadelphia, on June 13, 2011.